This week I'm excited to team up with Tanya from November Grey. Tanya is a blogging buddy of mine. I love checking out her blog for new spins on vintage style. The girl is totally beautiful and very talented. She lives in Los Angeles with her family and is a stylist (she's done acting and modeling too!). Tanya is great at finding stylish vintage pieces and today she's giving you a chance to win this glamorous vintage clutch. I'm a huge fan of vintage clutches and wear them all the time (like here, here and here). To win head over to November Grey and follow her blog (via Bloglovin' or Google Friend Connect) then leave a comment telling us you've followed and your contact information. This contest will end next Tuesday at midnight Pacific Time. Good luck. We can't wait to see how the winner styles it! Congrats to Sharon from Elegant Storms! You're the winner! omg awesome giveaway Taylor!! Love that clutch! Very nice clutch, I'm a follower! Followed her blog as well:) The clutch is gorgeous! I follow now! She has a great blog! I'm a follower now! Is it an international contest? Hey Taylor, I just followed November Grey...great give away and blog recommendation! This blog is amazing!!!! Not to mention, clutches are my favorite go-to accessory. I'm a follower! Im following now, great clutch! Love the clutch. I'm following. Thank you! Amazing! Will be sure to follow. We're having a giveaway too- enter for a chance to win a retro-revived flannel from Les Halles! love her blog. I'm a new follower! great giveaway! thanks for the heads up! I love the clutch! I am now following November Grey on google friend connect. her style is very cool, thanks for the reco. hope you are well. This would be an awesome edition to my collection of vintage purses! I am a follower!! I hope to win, cause my bag collection is totally limited because I am living on a budget. Thanks for posting about her blog, I'm now a follower! I love vintage, and I LOVE the clutch. Good luck to everyone! I'm now her follower-- love the clutch! I am a now following November Grey! Wonderful blog btw! just about the enter the competition! PS: I left you an award on my blog! Take a look! Love, love this clutch! I am now following via GFC! 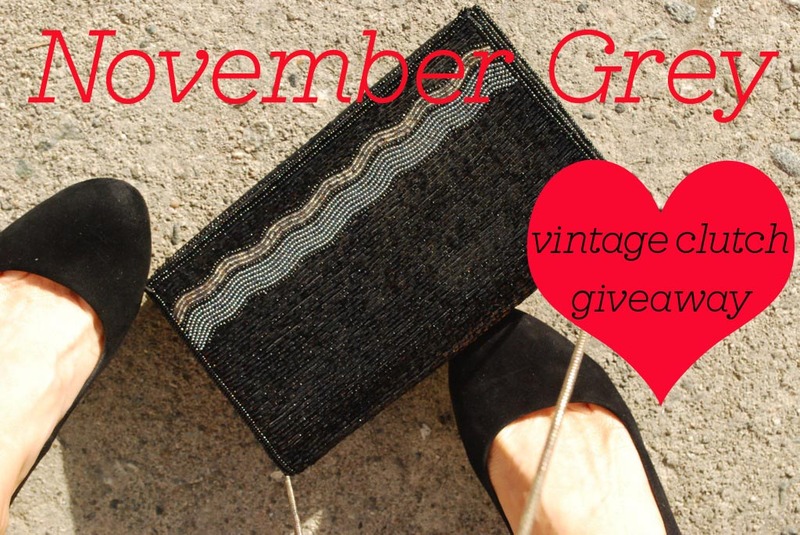 Love the clutch and following November grey! i'm following November Grey via Google Friend Connect. Love the clutch. I have become a follower! i'm the newest follower! her blog is great, as is yours! would love to win this beauty!!! I follow you both! Love the clutch! Love it! And love the blog! i follow her! gorgeous sparkly clutch! Hi sterling, thanks for introducing me to novembergrey. I'm realy into vintage style right now hopefully im lucky.